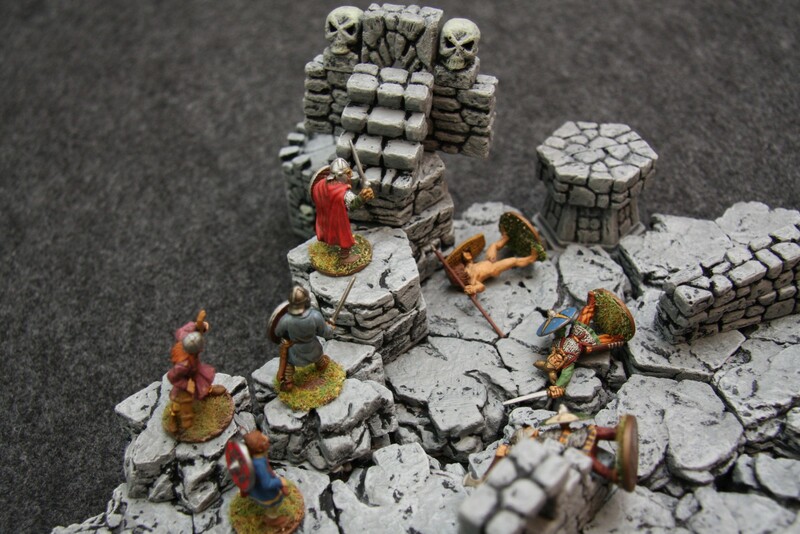 This article describes making and painting miniatures gaming scenery with Hirst Arts fantasy architecture. In this photo there are six 28mm warrior miniatures on top of board game hex tiles made with Hirst Arts silicone molds. You cast the pieces with dental stone mix, a ceramic material somewhat like Plaster of Paris, pop the scenery out of the mold, assemble the pieces, and then paint with acrylic paints. The 1.5" wide tiles are useful for many types of board and miniature games. Click on the photos to get a larger view. Here our six warriors are embarking on a quest to claim a reward. The king asks them to rid the nearby land of evil barbarians that press into the kingdom. A bonus will be paid if barbarian leaders as well as ordinary thieves are killed. Rumor has it that the barbarians have been amassing hordes of stolen loot as well. Our leader with the red cape has assembed two swordsmen, two axemen, and two bowmen. Soon the green and grassy land of the kingdom turns to barren earth. The border is marked with two ruined columns. After a short trek beyond the pillars, the band comes to a wall and heavy steel door. The barrier is marked with giant skull heads indicating danger beyond. 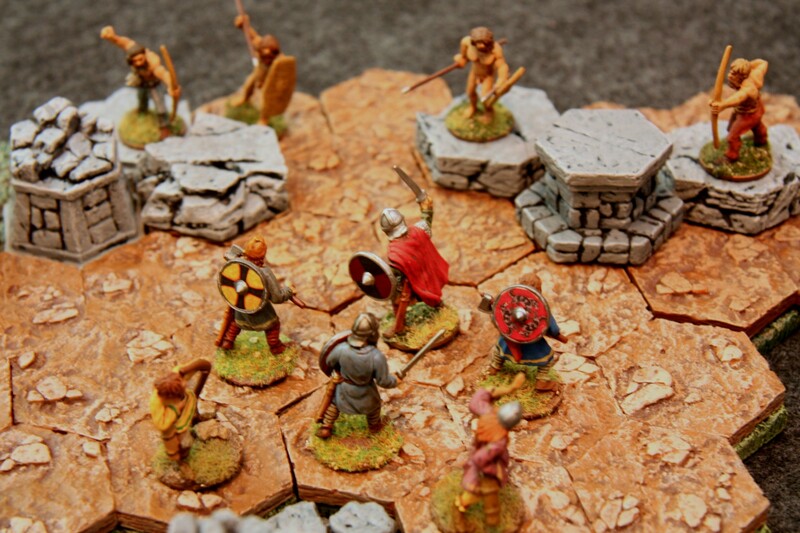 Figures are Gripping Beast Saxons and Arthurians. 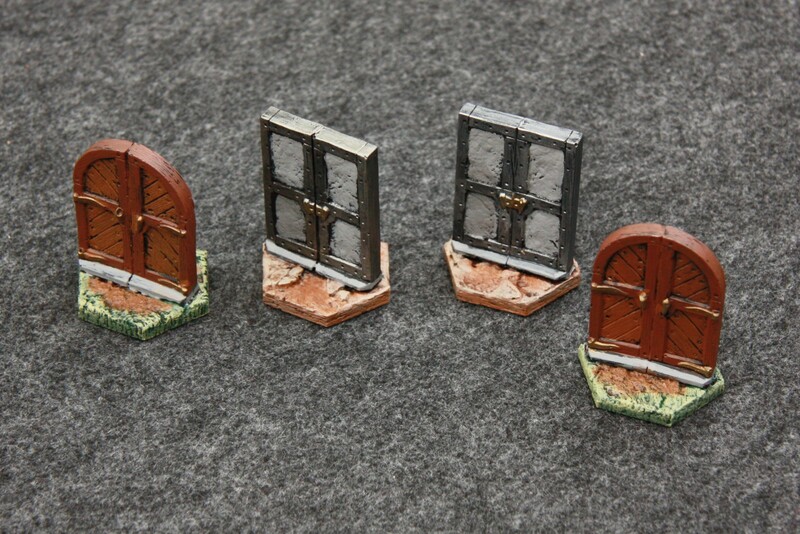 With the aid of magic and strength, the warband breaks down the steel door. The warriors enter a rocky ruined castle. Various pillars and fonts tell a story of a long lost kingdom. What riches were required to craft this dwelling amongst the craggy grounds? From among the ruins, a crazed band of barbarians attack the adventurers. With their javelins and bows, the barbarians fire on the warband. Although half-naked, the barbarians make up for lack of armor with their quickness and ability to dodge behind the rocks and ruins. Figures are Gripping Beast Germans. 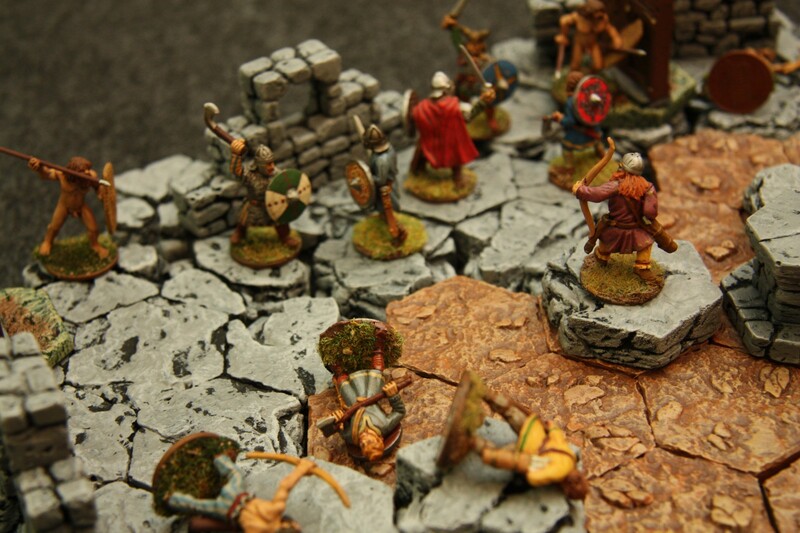 With their superior weapons, the warband pushes back the barbarians. But the alarm has been sounded and some superior barbarians emerge from behind the great wooden doors of their barbarian abode. The barbarian leaders join the melee. Arrows, blades, and axes flash from all sides. 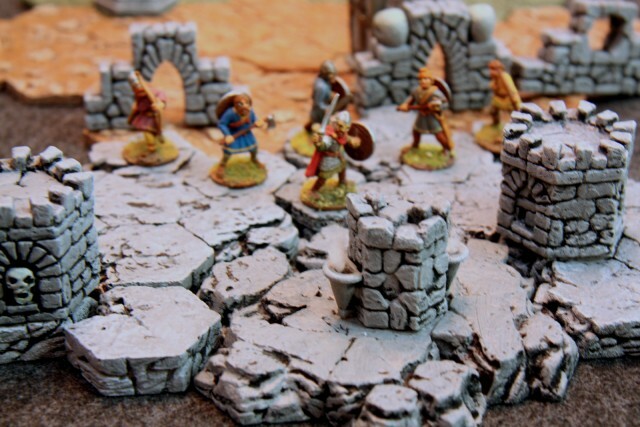 Eventually the barbarians are pushed back against a rock wall. There are casualties from both parties. The warband wins this battle. All of the barbarians have been killed or fled. Unfortunately, two of our adventurers have been killed also. Do the adventurers return back home? With two barbarian leaders killed, there will be a good reward. However, a staircase leads to another hall. Will there be more treasure? Or will there be an insurmountable horde? Our band pushes onward. 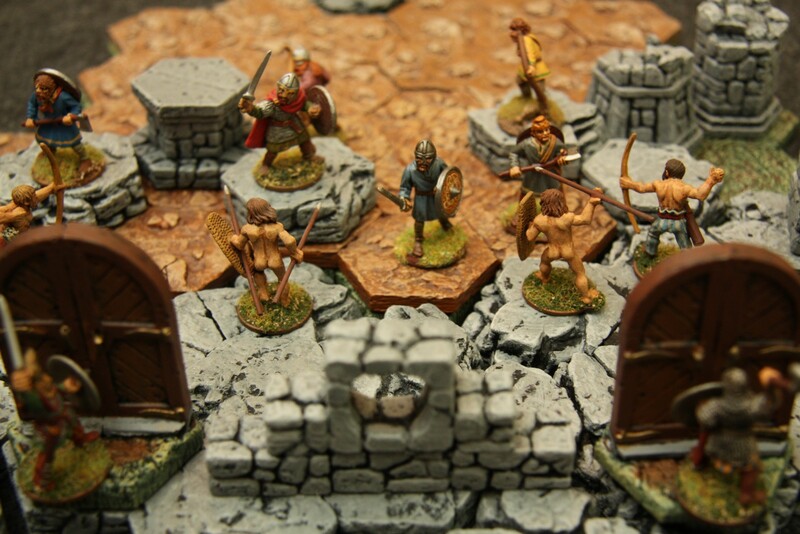 Thanks for reading about this miniature adventure. 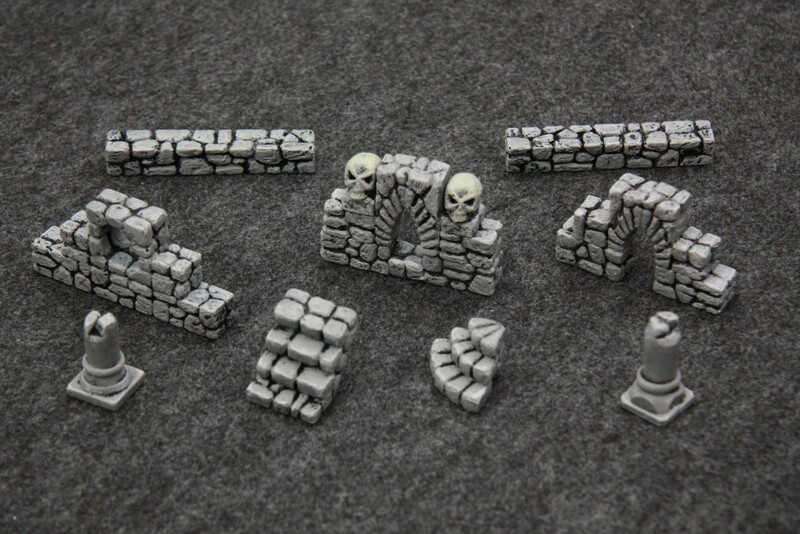 The rest of the article shows some of the tiles with some hints for construction and painting. This photo shows the grassy tiles. 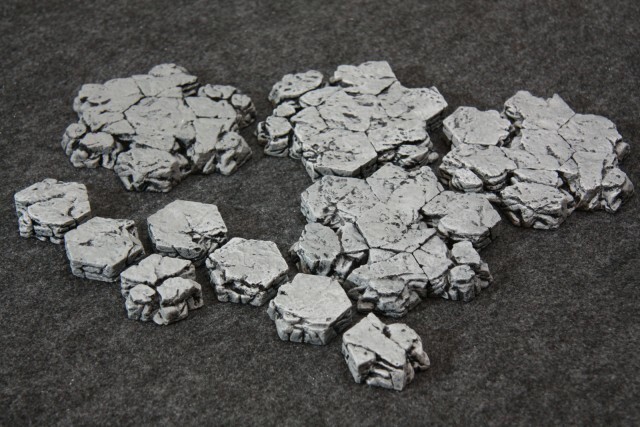 Each large mega-hex is made from seven 1.5 inch tiles. There also is a smaller 4 hex section. The tiles are cast and glued together with a tacky glue like Aleene's. This photo shows a number of earth color tiles. 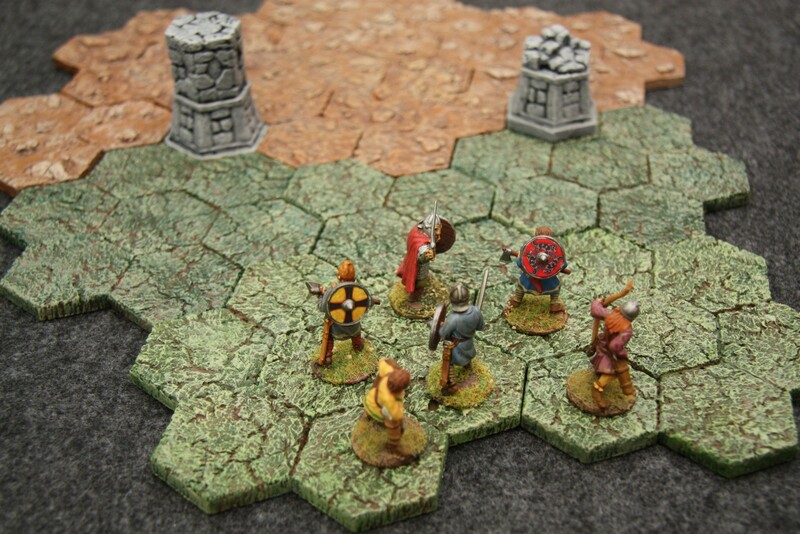 They come from the same Hirst Arts mold number 178 as the grass tiles. Again a base coat of chocolate brown, then a middle coat of medium brown, and a dry-brush of beige to bring out the rocks. 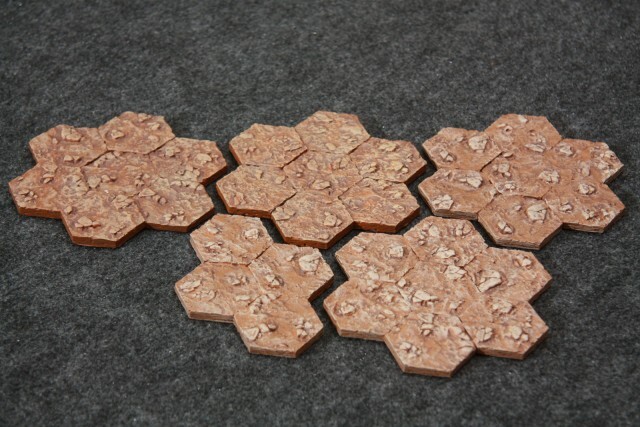 This photo shows some 1.5 inch rock tiles from Hirst Arts mold #180. These tiles are twice as thick as the previous tiles. There are four megahexes and seven loose tiles. The tiles can be stacked to make elevations (and modifiers to combat and cover) or they can make narrow passages. 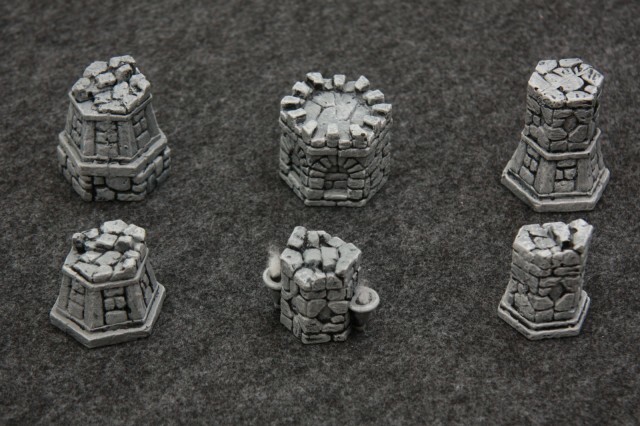 These are painted with a black base coat, a medium gray middle coat, and a 25% gray highlight. I really like the sculpt of these tiles. Some of the tiles have 6 finished edges, some have just 1 finished edge and the rest craggy and broken. 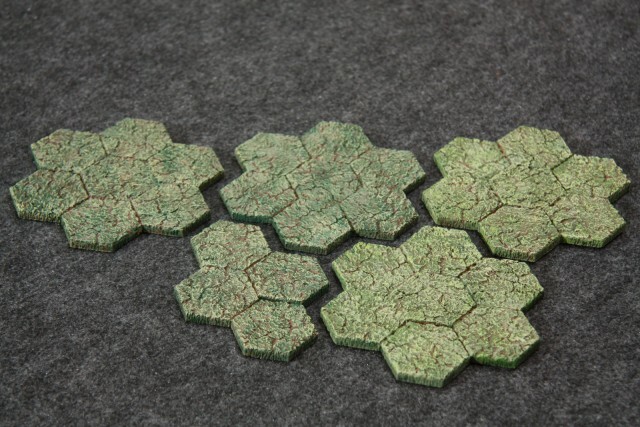 You can twist and combine these tiles to make very different sets. This photo shows some doors you can make with Hirst Arts mold #702, the fieldstone pillar and door mold. The doors are glued to hex tiles to prevent them from falling over. Here are some pillars you can make with the same fieldstone pillar and door mold. 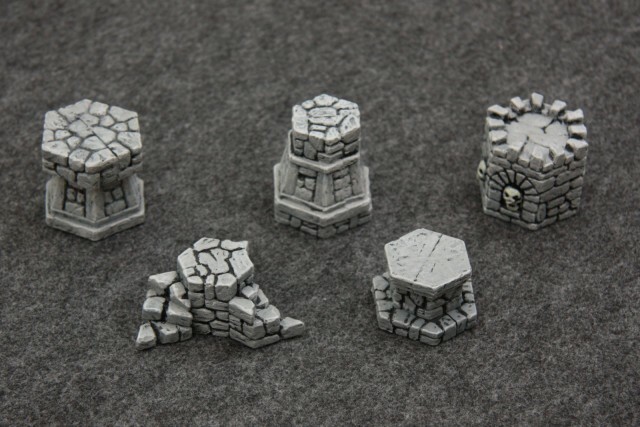 You can stack and glue the pieces to make various tables, columns, or turrets. Normally, the pillars are good for blocking line-of-sight and giving cover from missle weapons. Here are more various pillars. My favorite of this set is the front center pillar. There is some smoke (made from cotton) coming from the two fonts on the pillar. And finally here we have some walls and stairs. 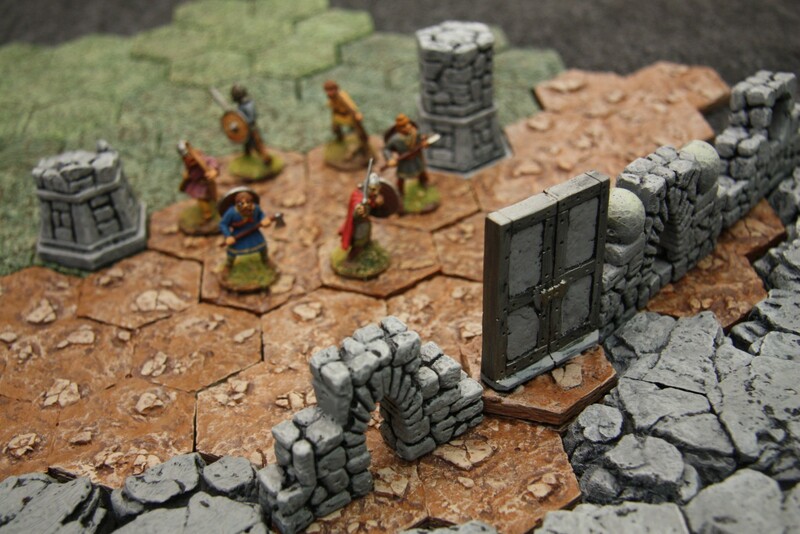 With the tiles and the scenery, you have enough terrain to make a small warband dungeon-crawl type game. I intend to use these with the new release of The Fantasy Trip: In the Labyrinth. I hope you enjoyed reading this adventure tale and seeing the gaming scenery. Last modified: Sunday, 16-Sep-2018 09:43:31 MST.